For several years Royal Mail and Post Office employees (and sub-postmasters who are neither) have received a Christmas card from the organisation together with 50 1st class Christmas stamps. Since at least 2003 the self-adhesive Christmas stamps on sale to the public have had the paper surrounding the stamps (or 'matrix') removed to make it easier to remove the stamps from the sheets, and to make them easier to separate into singles/blocks at the PO counter. 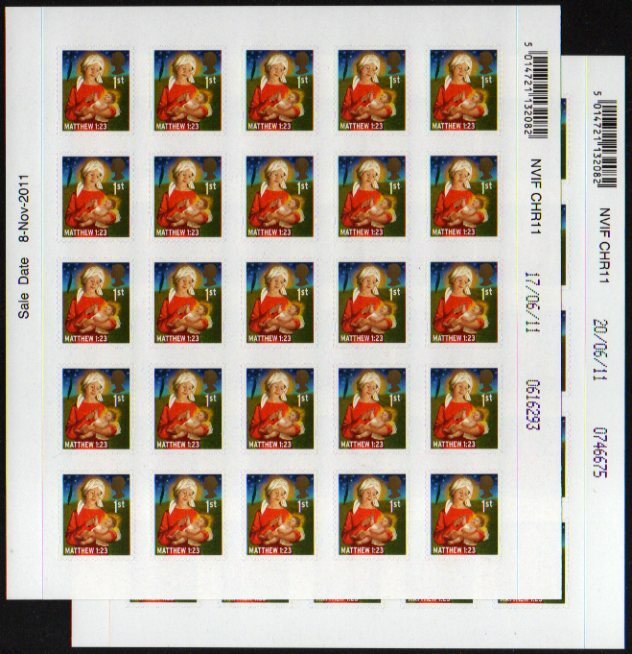 But the 'staff' versions have been sent out with the matrix intact, providing a collectable variation. Employees are not permitted to sell their stamps, but many are available to collectors either by exchange or through dealers. 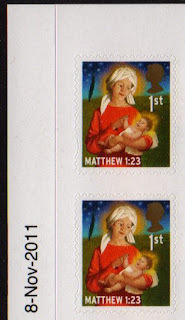 We understand that there were production problems with the 2011 Christmas stamps. Although most of the 1st class were printed in June and the 2nd class in July, we're told that some were printed in November. 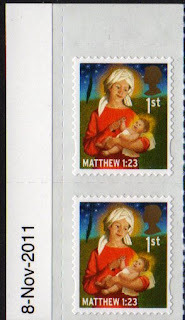 And the ones included in Christmas cards - which are always split into two sheets of 25 - might be any combination of top sheet (with printing date and sheet number) and lower sheet (with cylinder numbers) - and more seem to exist with matrix removed than intact. Despite the warnings to staff of dire consequences some have appeared on eBay, and we have seen 17/06/11 and 20/06/11 with both matrix removed and matrix intact. If you've seen any other dates - for staff freebies or those over the counter or from the Bureau - we'd be interested to know. Festive Greetings! A Merry Christmas !!! Golden Machin Horizon label mark III now in use. Christmas Madonnas - how many printings?